Unsure of what is missing from your best SEO services? Let’s say, you are now getting constant updates and reports from your specialist. So, you are assured that they are doing their job. But your gut keeps nagging that something is missing from your present strategy. That you are not getting the most of the benefits of SEO services. Considerably, web technicalities, in general, may be daunting to you. Which primarily was the reason you’ve hired professional assistance in the first place. All you wanted was to be seen by your market online. But when your gut is nagging you, most of the time it is actually trying to tell you something. Act now! Further delay will just cost you more. You’ve probably invested already in other auxiliaries yet relevant assistance for your overall digital marketing. Might as well make sure that you are actually getting the most of your web design. Go back to the reports submitted to you as well as activity logs. See if these services are included in your campaign. In this way, you will know what you are missing. This service focuses on the internal optimisation of your website. This is where your specialist will optimise your pages and content for search. Hence, technical tasks are included. Such as loading page enhancement, metadata updates, mobile responsiveness check and every other optimisation needed for your domain. 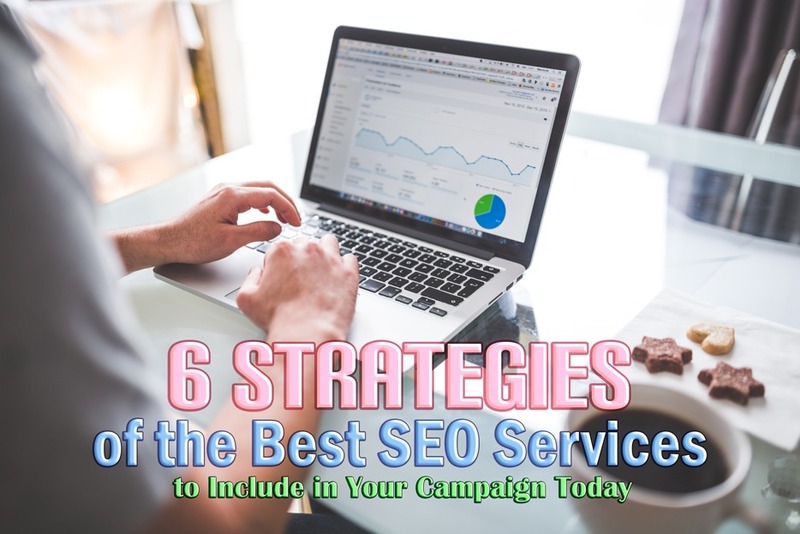 It’s rather a critical inclusion of your best SEO services and strategies. In fact, it is a fundamental part of SEO. And if your specialists are not doing it, think twice. You should start to reconsider employing them further. One of the best SEO services that is rather also fundamental. You need other website collaboration to boost your ranking. Hence, link building and any other offsite marketing strategies. This is more often the part of search engine optimisation where things get even more tricky. But what you are looking for are external links pointing to your website. These links can either be earned, bought, or acquired for free. Apparently, it is harder to earn a link than to buy them. And getting them for free is possible but limited. It would then depend on your funds as well as your specialist’s efforts as to how much you can get. Alternatively, social media campaigns can also be incorporated—or rather “should” be. By experience, social media can really make a difference to your campaign so you better check on that too. Having a keyword strategy is one thing. But having a solid keyword strategy is another. It’s rather daunting to dig deeper into the technicalities. But if your specialist will be happy to share some insights with you. Then it would be worthwhile to lend them your ears. The best SEO services, for the most part, subjects to your keyword strategy. Hence, you can consider it as one of the pillars of search engine optimisation. The best SEO services team are those who put effort to market good content. Because in the world of search engine optimisation, content is king. It’s not so much as simply writing and publishing per say. Proper linking, structured formatting and keyword positioning should be considered. Google instated analytics for a reason. So, your specialist should take advantage of it. You might see a custom report on your end. But analytics is a comprehensive analysis for your domain. Hence, you must ensure that it is part of the best SEO services in your campaign. Local searches are now gaining heaps of influence in the world of search engine optimisation. Experts are now looking to promote their client’s brand focusing on targeted markets. If you have a running such campaign, then it would be best to affiliate this with your strategies. Search engine optimisation is not a finite process. All tasks don’t have a standard order and inclusions. Apparently, every campaign is unique. But the inclusions above are at least the fundamentals. Hence, any campaign missing them will have a slow gain. And that is already saying a lot since SEO in the first place, is a slow and long-term process. Let the experts handle your campaign! We offer comprehensive search engine optimisation campaigns. And even add more expert innovations to give your digital trade the online visibility that it needs. So, don’t hesitate to check more of our services and read our blogs. Or even better, call our friendly staff now! Also, if you want to learn how your specialist should handle your campaign. Then you should read our article 5 Things That Only Top Ranking SEO Services Firms Can Do. This entry was posted in Aleph IT Services and tagged affordable seo services, affordable seo specialist, best seo services, local seo specialist, seo services, seo services company, seo specialist. Copyright 2019 © Aleph IT Pty. Ltd.